The narrative continues on the day following the governess’s late-night interaction with Miles. After the governess has finished her lessons with the children—during which they had been extremely well-behaved, which the governess finds suspicious— Mrs. Grose asks the governess if she has written the letter yet. The governess says that she has, but she does not mention that she has not yet sent it. The governess thinks the children’s outwardly good behavior is another attempt to conceal some kind of conspiracy, or to catch her off guard. And her secrecy toward the Mrs. Grose about the letter is important, as it shows she does not confide in her with complete honesty. Later, Miles asks if the governess would like to listen to him play the piano. She reflects on how, in her opinion, no child has ever lived in such “beauty and misery” as Miles. She thinks about how good he is, and how strange it is that he was ever penalized for anything. The governess is lost in the moment: she is so immersed in the music he’s making that, she realizes, she loses track of Flora. The governess asks Miles if he knows where Flora has gone, and he politely says that he does not. The governess is progressively developing a more complex, more adult image of Miles here. She thinks of him now as not only an innocent boy, but also as a melancholy character—unusually melancholy for a child. Though she still cannot believe that he has done anything bad, which shows she ultimately still thinks he’s an innocent boy. The governess, panicked, runs to find Mrs. Grose, who also does not know where Flora has gone off to. The governess says that Flora must be out with Miss Jessel, and she tells Mrs. Grose she believes that Miles had intentionally distracted her with his piano playing. When Mrs. Grose asks where Miles is now, the governess says he must be with Quint, that the two children intentionally worked together that day to set up meetings with Quint and Miss Jessel. The governess convinces Mrs. Grose to come with her outside to find Flora, even if that means leaving Miles with Quint. On her way out, the governess leaves her letter to the children’s uncle on a table for Luke, a Bly servant, to pick up and deliver. The governess’s suspicions of the children’s conspiracy are in this case possibly not unfounded. Her idea is not disputed by Mrs. Grose, and the presentation of the evidence here—Miles’s insistence that she listens to him play the piano, Flora’s sudden, unexplained disappearance—suggests that perhaps the children may have set this up. But because the governess is the one telling this story, some doubt should always be kept in mind—hers is ultimately the only perspective we have. Downes-Angus, John. "The Turn of the Screw Chapter 18." LitCharts. LitCharts LLC, 1 Dec 2013. Web. 24 Apr 2019. Downes-Angus, John. "The Turn of the Screw Chapter 18." LitCharts LLC, December 1, 2013. 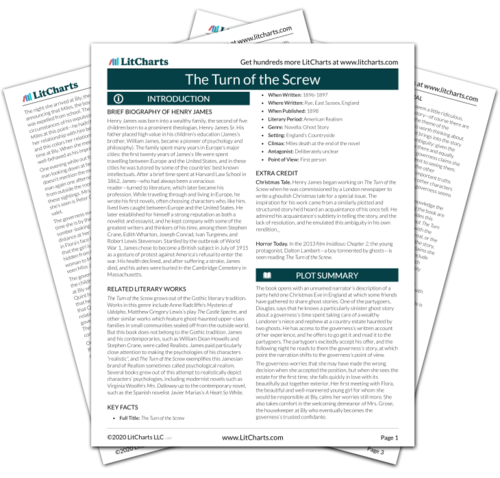 Retrieved April 24, 2019. https://www.litcharts.com/lit/the-turn-of-the-screw/chapter-18.